Zelie’s mother was killed because she had magic. Many people were killed during The Raid, when magic disappeared from the world and those who once had used it were targeted by the king. Since that fateful night all those years ago, the magic was gone. Zelie had the white hair that indicated magical potential, but no magic could be found in the world. Then, a princess touches her with a mysterious scroll, and Zelie begins to find the power in herself that her mother once employed. 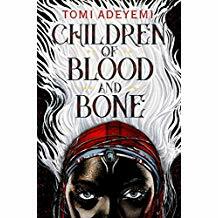 The magic may be gone from Zelie’s world, but that is only because Tomi Adeyemi has put it into her amazing novel Children of Blood and Bone and has thus brought it into ours. It’s easy sometimes to reduce stories to tropes. Hero’s journey? Check. Love story? Check. Misunderstood princess? Check. Young and untrained people discovering how to use magic? Check. And, sure, fine, those familiar themes are present in this novel. What sets a novel apart, though, is when it makes familiar ground new and exciting and different. Here again, the easy and cheap thing to do is grab the obvious differences: Africa, not Europe or America. But this book is not different only because it is set in a part of the world that is underrepresented in published fantasy literature. This book is different because it is really, really good. The world building is amazing. The characters are real and flawed and heroic and common and everything you want in a character. Some of the scenes take your breath away. There is magic in this book, and it is not from the spells or the mystical powers or the artifacts. The magic is in the writing and the creativity and the depth of the story. The bookChildren of Blood and Bone may hide on the YA shelves of your local library, but it is a very mature story that should appeal to all ages. I could not put it down. Two of the three main characters are female, but this is not a “girl’s” book (or a “boy’s” book–if there are such things). This is a good book. Will girls and women be thrilled to see the heroics come from a “her”? I hope so, but boys (and men) will also love to see the strength of these characters. As a reader, I also loved watching the growth and change in the characters through the course of the book. None of the three main characters is perfect, all are flawed, and all of them are different by the end than they were in the beginning. And although the next novel is perfectly set up, I have no idea what direction the characters will take in the next part of the story. I just know I am very eager to find out.